Custom-fit high-polished gold grillz with diamond cut triangles. When you choose yellow gold or rose gold, we will add a white coating on the diamond cuts for 2-tone look. If you choose white gold, silver or platinum then your entire grill will be that single color. Photo shows 4 top yellow gold grillz. 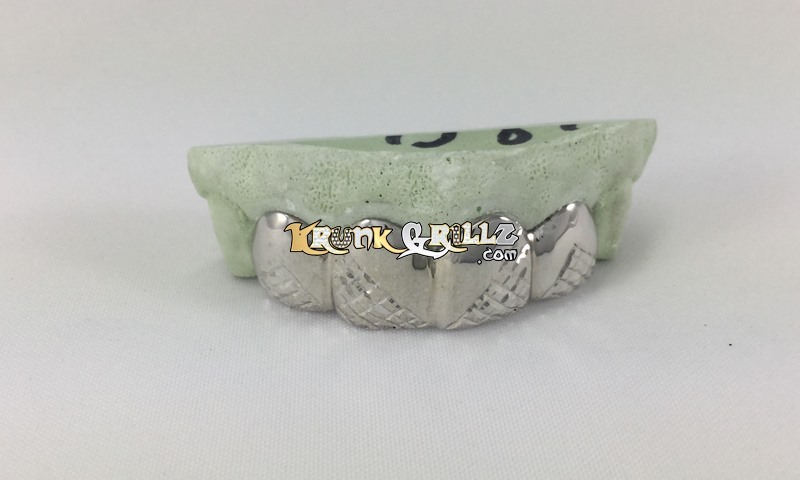 Krunk Grillz does not perform dental procedures such as permanent gold teeth. Please purchase a do-it-yourself mold kit have or have an impression created by a licensed dentist. We will not be held responsible for loss or damage whatsoever caused resulting from you sending us your dentures. We will refund 100% of your grillz purchase, upon request, if the grillz has not been made and your order is less than 60 days old. No refunds will be given on completed grillz or if we have not received a good mold within 60 days of transaction. For more information, please read our terms and conditions.